In this closely trimmed historiated initial S from a gradual, the illuminator represented Saul's dramatic conversion to Christianity. Dressed in a soldier's helmet and armor, Saul tumbles to earth, his horse collapsing beneath him. Though the artist omitted the rest of the biblical account, in which Saul changes his name to Paul and takes up an evangelical Christian mission, the initial's viewers would have been familiar with the story. In the top half of the initial, another soldier, seated erect on a more elaborately liveried steed, wears a fancy hat and tunic trimmed in green, white, and red, the colors of both the Gonzaga and Este families. Given his visual precedence in the image, this man may have been the book's patron, commissioning the gradual for use in his family's private chapel or for an ecclesiastical foundation under his protection. Interplay between the naturalistic and decorative elements in the initial adds visual tension to the miniature. 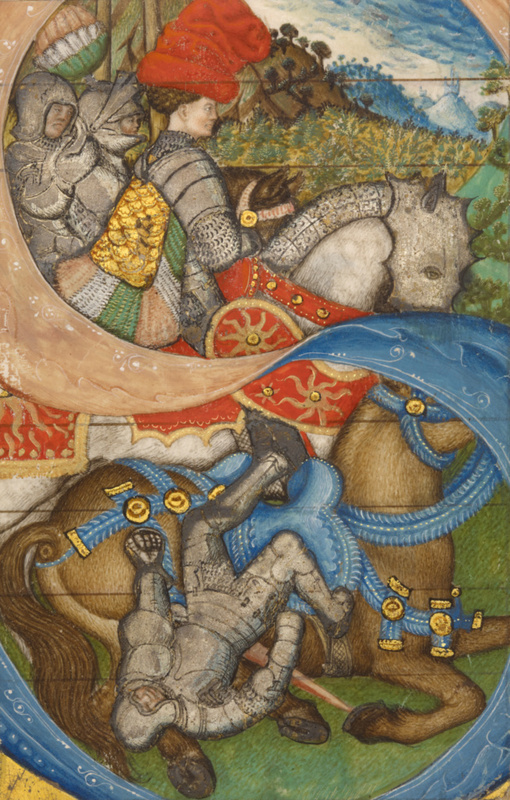 The artist represented the imposing physical presence of the horses, including details such as the horseshoes and armor and subtly modeling the surfaces, such as the animals' coats. He then harmoniously integrated these carefully observed figures and their details within the artificial constraints of the shape of the letter S.